Alix’s Closet How To :: Stretching Yer Shoes! Ouchie, owie! Tight shoes. The bain of my existence! Back in the day I could rock a little vintage pointy pump, or a pair of shoes that were just a weeee bit too tight. But now? I have a zero tightness policy. I would rather wear a pair of shoes a size too big than suffer a pinchin’ on my big toe. Dare I admit I’m workin’ a bunion over there? Oh yes. I am. 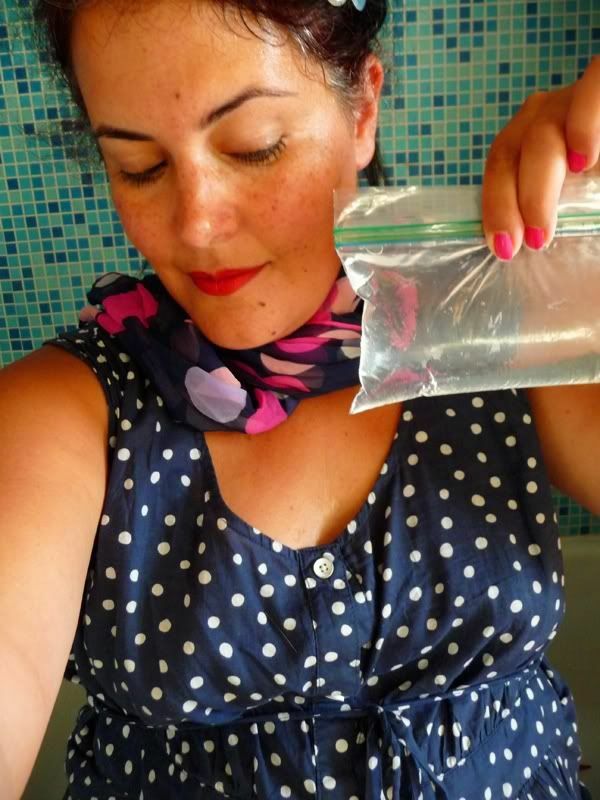 No, there isn’t a magic stretching liquid in that little bag….it’s simply a little zip lock baggie of water! Just you wait, it’ll all make sense. 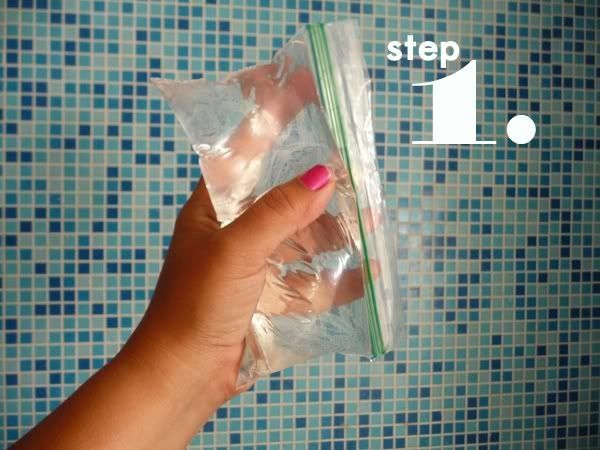 Fill a ziplock bag of water. Don’t use a cheap one, you def want to make sure that the bag doesn’t leak. I used the little snack size bags because my shoes were little flats (and I wear a size 7…or 8 if i’m wanting a little more roooom!). Don’t fill the bags to overflowing, just 3/4 of the way is fine. Now insert the baggie of water into your shoe, make sure it is down deep inside if that’s the area that is too tight. Mine are always a little snug across the toes. Again, do make sure that bag is sealed tightly! Stick those shoeies in the freezer! 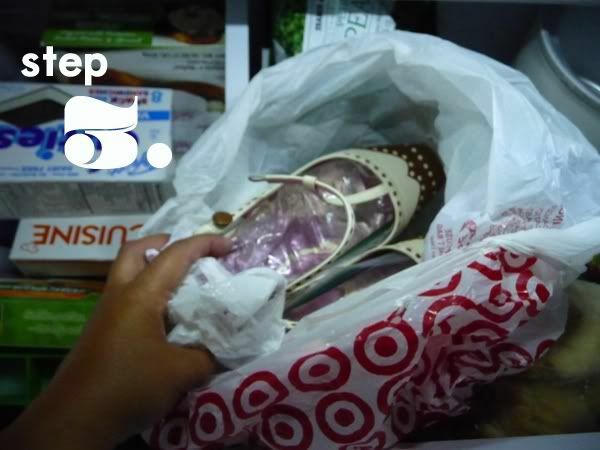 Of course you should put the shoe in a plastic/paper bag first, to keep things clean (and you may want to warn family members so they don’t think you’re crazy for putting shoes in the freezer!). Now we let the ice freeze. Here’s the thing. Water expands as it freezes….and as the water expands inside the shoe, it will stretch the shoe with it! Genius! It’s not a perfect system, but it worked for me. I would say I think it works best on leather shoes….i don’t know if I’d try it on boots. You kind of want a shoe that you can manipulate your zip lock baggie in easily. I think strappy sandals/heels, pointy toed pumps and flats like these are probably best. So, to recap! 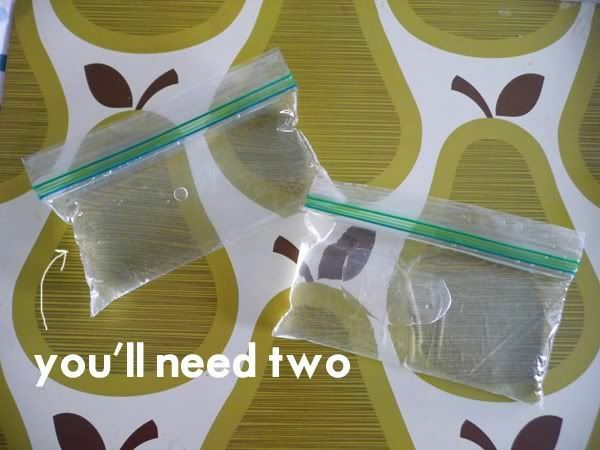 Fill two small ziplock bags 1/2-3/4 with water. Make sure they are sealed tightly! Insert them inside your shoes. Stick those shoes in a plastic bag and place them in the freezer. Leave inside the freezer until the water has completely turned to ice . Remove from freezer and let thaw (approx 20 minutes). Don’t leave the ice in to melt completely or it could burst. Try on your shoesies and do the happy dance! 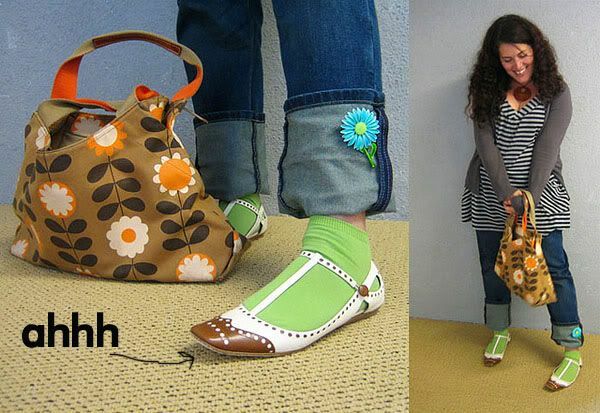 Tagged with easy ways to stretch shoes, how to stretch your shoes, stretching shoes. lady, you’re brilliant! I will try this soon! This is such a great idea. I have problems with proper shoe fit due to wide feet. I am going to try this today! love this idea! any tips on how to stretch the calves of boots? Apparently since I have size 6.5 feet I am also supposed to have the.world’s.skinniest.legs. With taller boots I sometimes find myself having to buy a size 8 just to get them to fit in the leg. Cara, RIGHT there with you! Also, I really need to start rocking the brightly colored ankle socks. Barefoot in shoes just KILLS my feet. I am the same way with shoes–comfy shoes rule! I have such an issue with shoes that seem fine when tried on in the store and then turn into horrible shoes of tightness doom when worn for a full day. I’m going to try this on a pair of shoes tonight! Are those vintage shoes? I love them. I would love something like that. I hae been looking for a pair of spectators for a while. OK this is super smart! I love it when I can use science on my side! Plus, this can help feed my shoe addiction! You have solved my problem! My shoes are too tight now I get the GOUT all the time. Thanks!!!! Thanks for the tip! I’ve been thinking of giving away a couple pairs of my (nearly new) shoes because they are a little too tight. Love your vintage flats! I am sending a magic spell your way. You are truly A gem!!! Oh, I’ve got to try this! My feet grew after having my baby girl and now my favorite Frye peep-toes are too small! Thanks! Hello, do you think it would be wise to try the frozen water method with suede shoes? I bought a lovely pair of suede shoes at the sales and they were comfy enough at the shop but when I tried them on later at home they felt tight unfortunately I cannot take them back as they were a sale item. Grateful for any advice about stretching suede shoes. I have since learnt that it is better to buy shoes in the afternoon when feet tend to swell up. I think suede/leather stretch the easiest. I’m not an expert, but as long as you make sure the zip lock bags are sealed tightly, i think this method should work! GOOD LUCK!! how long do I leave the shoes in the freezer?